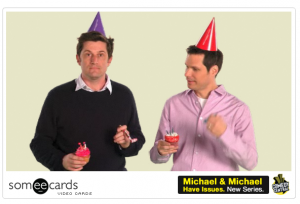 Say Hello To The First Someecards Video Cards. Ads That Are Hilarious. As we wrote about a couple weeks ago, Someecards, makers of hilarious online greeting cards, are delving into doing video cards. The first batch are now online. And yes, they’re quite good. The cards feature the same solid color backgrounds that are distinct on Someecards, but rather than black and white drawings, they have actors acting out short video skits. The first ones feature comedians Michael Ian Black and Michael Showalter, who are promoting their new Comedy Central show, Michael & Michael. Yes, these are ads. But as we wrote previously, these are the best kind of ads cause they’re actually funny, and something I would watch. Plus they have a lot of swearing. Watch below. I really want to embed them all but they auto-play (I’ll embed the one with no swearing until the end but be warned, possibly NSFW). Watch the rest of them here.